2 I. Why this topic? 3 II. What do we aim to achieve? 5 IV. How is succession management done now and what are the issues arising from it? 6 V. How can we improve succession management at KM4Dev? The core group plays an important role in the leadership of the KM4Dev community and ensures its effective functioning. However, the processes and systems for encouraging community members to be a member of the core group, and for initiating new recruits into core group life, are quite random and not as institutionalized. On the one hand, this can affect the enthusiasm and performance of new core group members, who may feel a certain lack of direction and guidance. On the other hand, it can impact on the effectiveness of the core group, as its success in fulfilling its mandate relies on whether and to what extent its members can deliver individually and as a group. II. What do we aim to achieve? What resources have already been developed in KM4Dev to frame core group succession and Initiation? What activities or interventions can systematically be done to ensure the community understands the role of the core group and to entice interest from community members to join? What system and methods can be put in place to welcome new core group members so they clearly know their roles, they have an increased sense of belongingness to the core group, and they feel motivated to perform? What existing resources, documents or archives need to be shared to new core group members? What resources or aids still need to be created? We reviewed some literature on succession planning and management, both those coming from the private sector and related leadership topics in communities and networks (such as the notion of distributed leadership), to get a better sense of how to approach the topic. 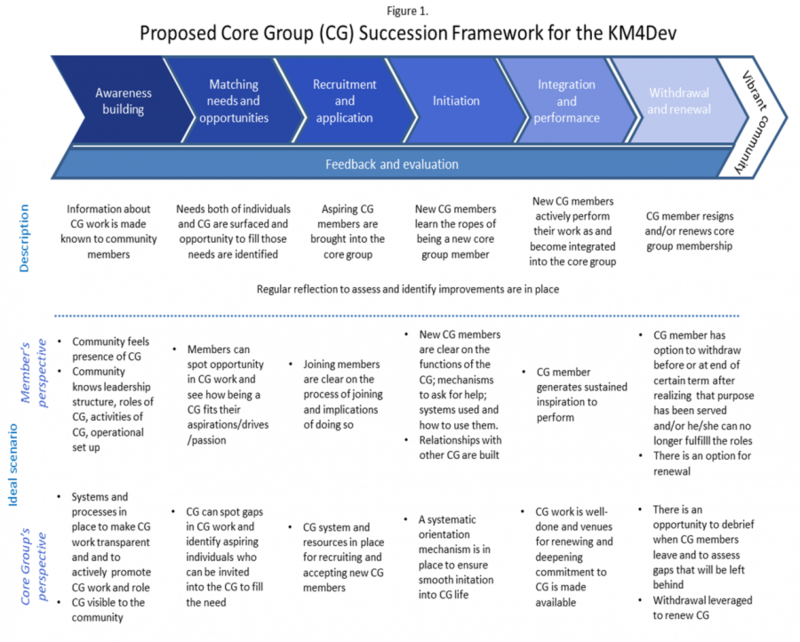 Putting together what we found relevant to the KM4Dev community, we arrive at a succession framework as presented in Figure 1. 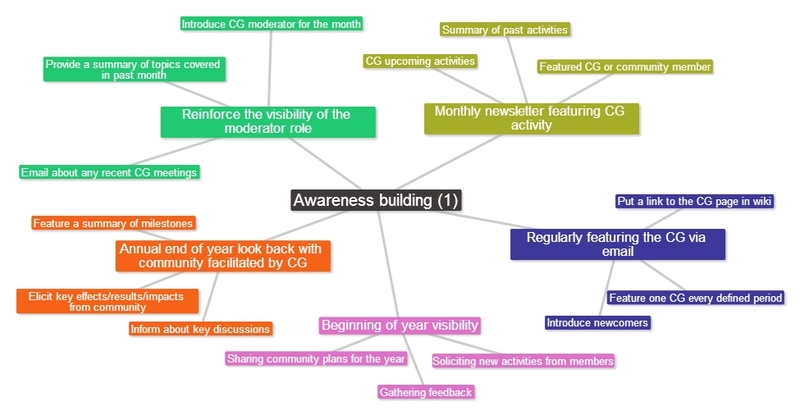 The framework illustrates how succession starts with building awareness about the Core Group among community members, which is a pre-requisite to a matching of needs and opportunities, which is needed before an individual becomes a CG member, after which the new recruit is initiated into CG life, executes his/her functions, and eventually and at an opportune moment withdraws and/or renews his/her involvement with the core group and the community. Recognizing these stages and how it contributes to a well-functioning and vibrant community is important. Also, each stage is a learning opportunity so feedback and evaluation is a key element all throughout. The framework presents two perspectives in succession management – the perspective of the individual, a community member who is a potential core group member; and the perspective of the core group. For us, it is useful to expose these two perspectives because in reality, both have roles to play and while there may be differences in their views, it is in the convergence of their objectives that succession management is most successful. IV. How is succession management done now and what are the issues arising from it? Figure 2 presents an overview of the current set-up and processes, the available resources, and an initial assessment of issues per stage. Overall, we observe that succession management is not a deliberate and pro-active function that the core group does, except from invitations extended publicly primarily during face to face events. In many cases, becoming a member of the core group is a decision done by the individual after probing with some core group members and going through a certain level of internal matching of his/her needs and what a core group membership can provide. “Practice Tip: Discussion Summaries” which provides useful tips in summarizing focused conversations modified 6 November 2013. Is there an optimal number of people in the core group? Is there a mix of skills, experiences, backgrounds, expertise that should comprise the group? Are there other functions that the core group should be doing that it is not yet doing now? Are there functions that the core group is currently performing that it should not be performing (e.g., should some coordination work be done by another entity or an individual)? In the ideal scenario, admitting members to be part of the core group is based on an assessment of gaps, and the ability of a candidate to fill a gap is one criterion to be accepted. Having an assessment system requires though that there are parameters against which to assess, and this brings us back to the questions listed above. Once a member joins the core group, he/she gets added to the dgroups and start receiving emails sent to the core group, as well as reminders to fill in a doodle poll to indicate availability and preferences for mailing list moderation. There is no orientation pack as such, and the most comprehensive written resource to guide the new core group member is the Terms of Reference with links to other useful resources (mainly on how to moderate the mailing list). Perhaps the most valuable resource available to the new core group is the core group itself, who can easily be reached for guidance and assistance via email. This can be considered a strong feature of the community though there are instances when email communication may not be the most optimal method to bring newcomers up to speed with core group work. For instance, the complex technology set-up of the community (given that it operates in different systems) can be thoroughly confusing, and may be more effectively learned by a new comer via walk-throughs or a more detailed IT systems guide. The integration of new core group members into the existing group is an important stage in the succession management process. This does not just refer to acquiring the skills and the knowledge to effectively perform core group tasks well, but also to interpersonal relationships that need to be nourished and deepened. In a few core group meetings, it has been acknowledged that strong ties and trust were key factors contributing to good working relationships and a better sense of togetherness, cohesion, and belongingness in the core group. This facilitates better coordination, easier communication, and faster resolution of looming issues, among others. There may be other methods to tighten the core group, but meeting face to face is clearly at the top of the list. However, opportunities for face to face gathering is often tied to bigger (and funded) knowledge sharing events that may not be regularly organized. If the core group indeed sees value of having regular face to face activities, then the question of how when (how frequent), where, and how (considering funding constraints) need to be discussed further. Leaving the core group is a normal stage in the process. In the current set-up, this stage simply involves sending a notification email to the core group. When this will happen cannot be anticipated, as there is no fixed term (duration) of a core group membership. Whether there should be a fixed duration for serving in the core group, with perhaps the possibility of renewal, is a question that can also be examined. 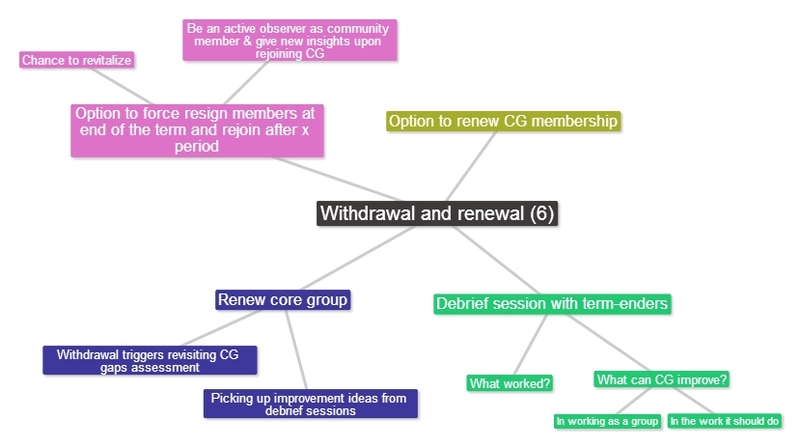 Will having a decision point to withdraw or renew allow for better reflection from core group members on the benefits and areas of improvement of being in the core group? And in the process of identifying and later on acting on improvements, will this increase core group effectiveness and prevent core group members from resigning pre-maturely, as potential triggers related to core group work are spotted and resolved early on? Regardless of the question of “term”, the withdrawal stage is one that lends itself nicely to gathering feedback and evaluation. Areas of improvement for both the community and the work of the core group can be gathered during a debrief session with withdrawing members. 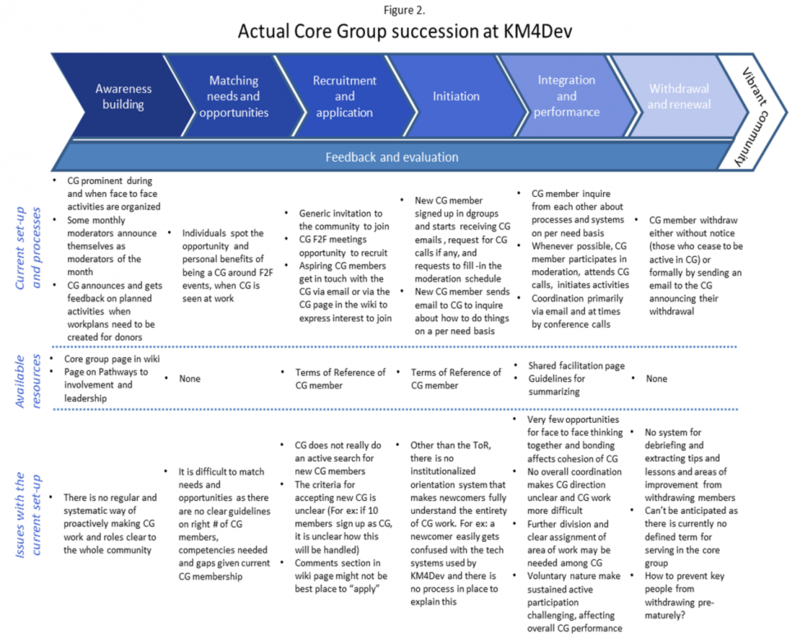 V. How can we improve succession management at KM4Dev? 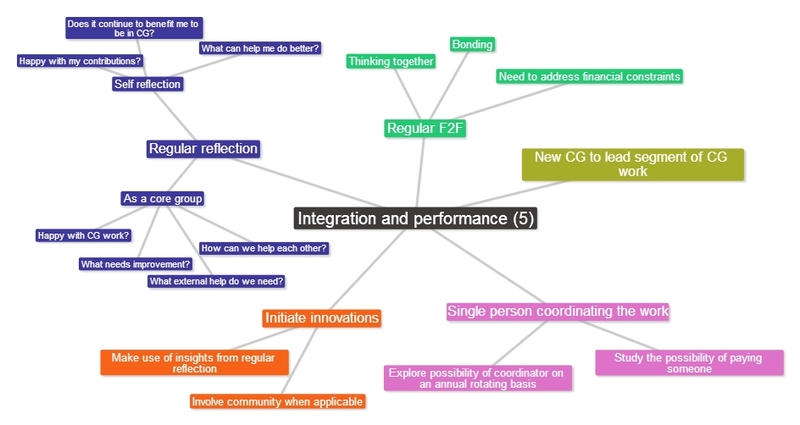 The following mindmaps offer some ideas on how we can improve succession management at the core group, with each mindmap focusing on one stage in the proposed framework, as presented in Figure 3 below. Some of these ideas are more feasible and applicable than others; some have already been identified in the current discourse while some are new; some may be conflicting and may not go well with another, though many can be combined if we want to achieve the best results. Together, the ideas can serve as starting point for further brainstorming and discussions with the community and the core group. Who's who in core group? What can help me do better? Does it continue to benefit me to be in CG? How can we help each other? What external help do we need? This page was last modified on 25 February 2014, at 13:42. This page has been accessed 9,606 times.